Valthonin, he is made out of material. I have got bags full of material that I cut up and use for my collages, toys etc. If I am going to sell them then I have to speed up the production as that one took a long time to make. I think though as the more of them I make then the easier it will get. I will start the Darth Vader for my son soon and I have decided which ones I will make for my other children. Well?Aren't you going to tell us which ones you have decided to make for your children? wow, can't wait to see the Malak one either. Think you could make Yoda? Hey Hey don't make it a family airlom! 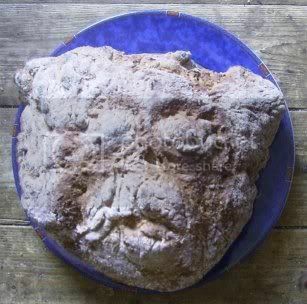 I was making some soda bread (I call it Yoda bread though) and I decided to have a go at shaping it like today when I was making it. hmm, hard to see, this is. nO ofFeNse But You ReaLLy ShOuLd sTicK TO sEwInG. Is your caps lock brocken or somthing . Karson's just trying to be funny. I can sort-of see Yoda. Good job!